At Starr Law Firm, P.C. we work with you one on one to help you with the important legal issues that affect your business, your property and your family. With over 35 years of combined legal experience, our attorneys use their unique backgrounds and skills to work one-on-one with you to develop and implement a personalized legal plan to realize your business and personal goals. Personable, responsive and focused on the needs of those we serve, we provide dedicated representation and effective results. 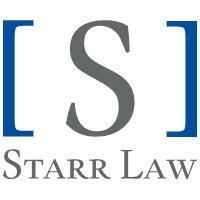 For more information on how Starr Law Firm, P.C. can help you, contact us to speak with an attorney.